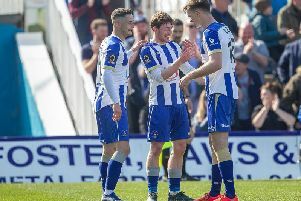 Stamford manager Graham Drury wants his underdogs to match their defensive heroics from the last round in tomorrow’s FA Cup tie away to Hartlepool United. The Evo-Stik League Division One side won 3-2 at Wrexham last month to clinch their first ever tie in the first round proper. Pools provide the opposition, and boss Drury anticipates a testing afternoon for the side 95 places lower in the pyramid. Drury told the Peterborough Telegraph: “We know it’s going to be tough. We are not naive. We are massive underdogs. “But if we can defend like we did against Wrexham, when we kept them quiet, just the one goal at our place and then two late goals at theirs, and hit them on the break then we have got a chance. The Daniels will have the backing of more than 400 fans at the Northern Gas & Power Stadium, and Drury added: “I don’t think it is going to be all that different to the Wrexham game. “That was like a cup final for us. We have got to repeat how we played against them. “We want that feeling again, it was a fantastic changing room after the game. Stamford travel north today ahead of tomorrow’s 2pm kick-off.